I managed to snag a few items for myself and for others. I may do a haul video in the near(ish) future. On our last full day in Hong Kong, I wanted to check out a temple or two. First, we made the hike (by “hike” I mean we rode the metro for longer than normal) to Chi Lin Nunnery. We wandered the paths of the lush gardens before entering the temple gates. The garden is impeccable. It was so well manicured that I was starting to think that some of the trees were fake! After we were finished admiring the beauty of the gardens, we stepped into the temple. We were greeted with the aromas of incense. We were not allowed to take pictures inside the temples which I can respect. 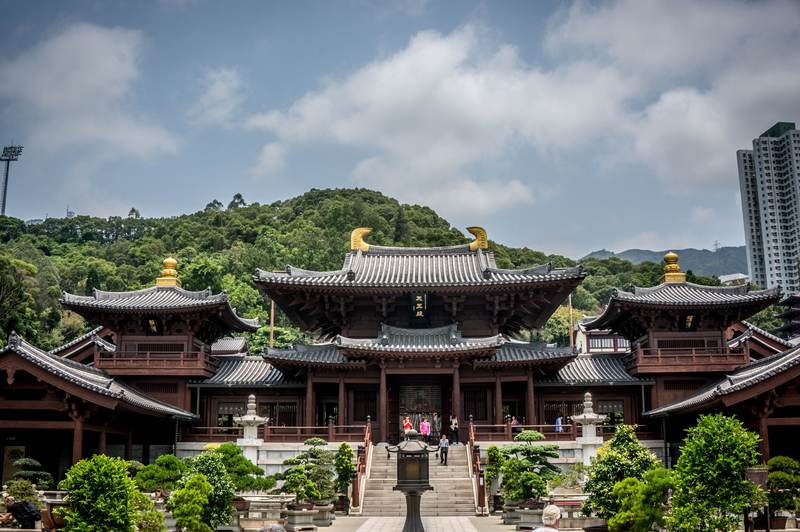 Each building held a different buddha statue that represents a special virtue. The intricate statues were surrounded with offerings from visitors. 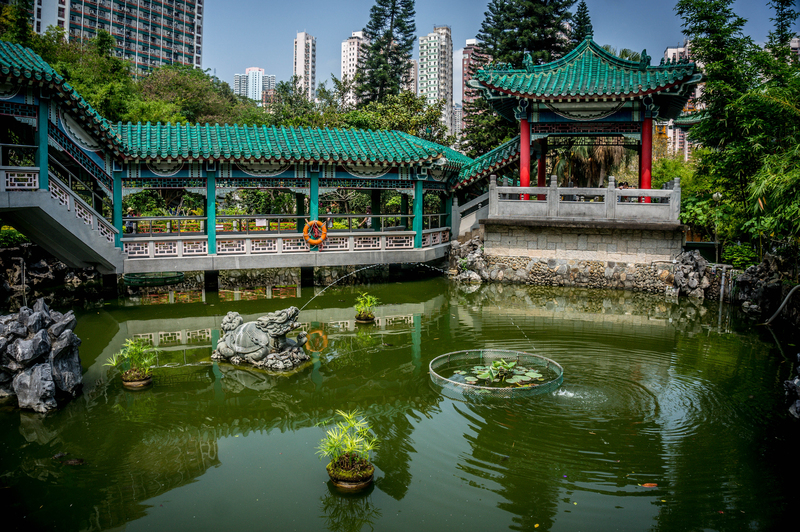 Next stop was Wong Tai Sin temple. 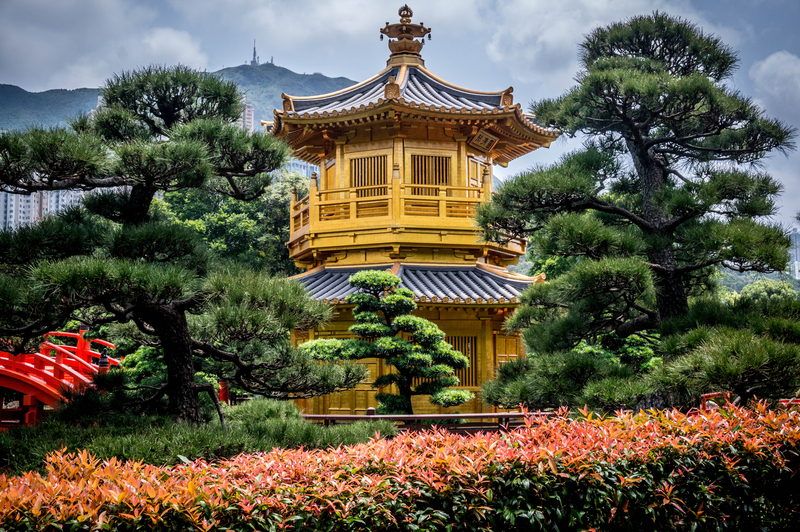 This is probably the most popular temple in Hong Kong. 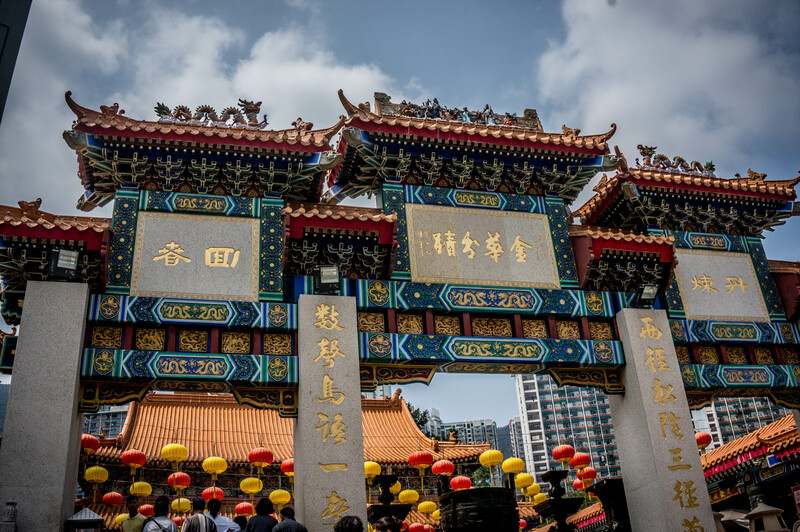 In contrast to Chi Lin Nunnery, Wong Tai Sin Temple was very busy with worshippers. We did a bit more shopping at the street markets by the central. There were so many little hole in the wall boutiques with the cutest affordable clothes for kids. There were probably alleys for adults, but I was on the hunt for my little girls back home. We literally had maybe 5-10 minutes to shop so I did what I could so we could make to our next stop. The hike to the peak station was much further than we anticipated. We were sweatin’! We stood in line for maybe 30-40 minutes to purchase tickets only to find out we could’ve worked around it! The signs outside the station were quite vague. I knew that we only needed the octopus card to ride the tram, but I had no idea we could also use the octopus card to pay for entry! 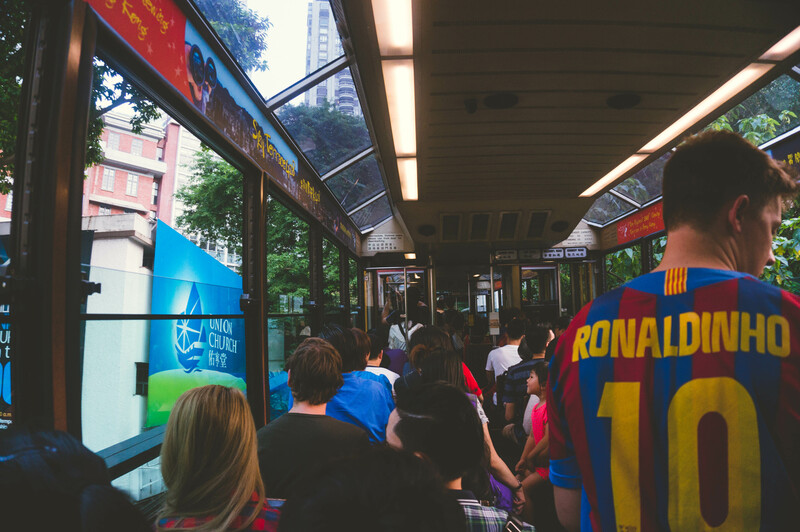 Learn from my mistake – load up your octopus card and skip that line! The line really wasn’t so bad though. It looked more intimidating than it actually was. We used Ittybot to our advantage nagged ourselves some decent seats on the tram. Although we were on the wrong side, we still enjoyed the nearly vertical trip up to the peak gallery. If you’re going to take the tram, try to sit on the right hand side. You will get an amazing view! You can still see from the left side but the photographer in me wanted pictures from the window. I know, I’m needy. Once we went up what seemed to be 20 escalators, we made it to the viewing deck. The city from above is quite impressive. 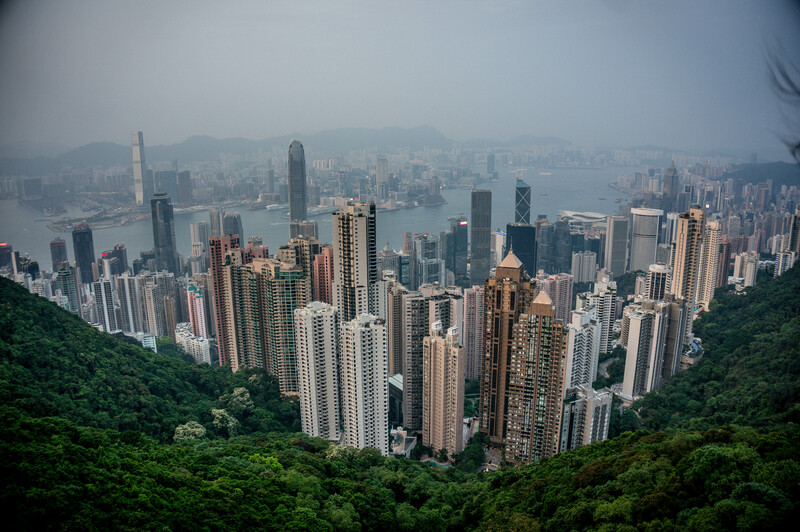 Skyscrapers were packed into view with trees surrounding the frame. We made it before sunset just like we had hoped. We watched nightfall on the city and saw the lights illuminate the bustling metro. After watching day turn into night on the skydeck, we went to grab dinner and did more shopping! I really wanted to see if I could find some mini instax film for cheap. Unfortunately, they were about the same price as amazon but I did find some savings on the designed versions of the film! I can’t wait to put them to use! Hong Kong treated us well. We ate lots, shopped even more and had quality family time most. We were lucky to get a few days in Hong Kong AND knocked it off The Mr’s bucket list. This is a city we can see ourselves visiting again and again. 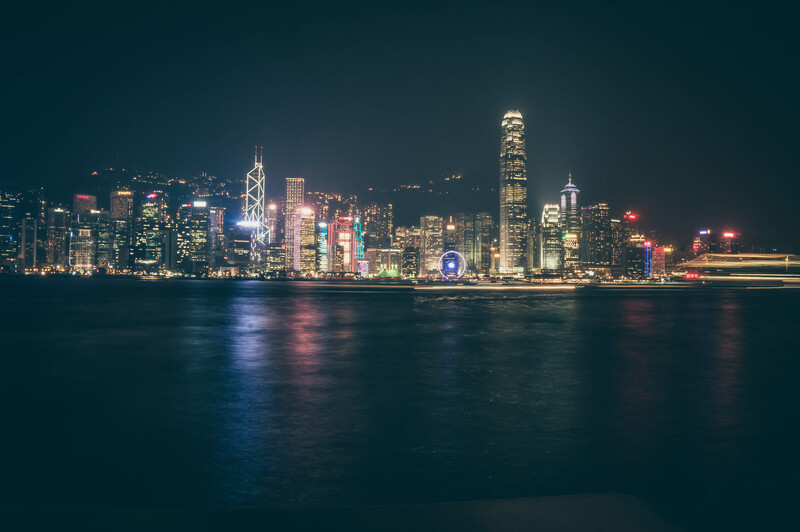 Jetsettin’: The bots touch down in Hong Kong! + Vlog! After Sanya, we took a short 1.5 hr flight over to Hong Kong. The Mr has a love for Hong Kong films so this was on his bucket list. Come time to plan what he wanted to do in Hong Kong, he drew a blank and made me put together a plan. Figures. I laid out several possible itineraries and he picked (and cut out plenty) our activities for the final leg of our trip to China. We stayed at the Holiday Inn Golden Mile because of it’s location. The metro is literally outside and we were next door to iSquare Mall and we were able to grab our morning Starbucks. Of course, we asked for an upgrade. I figured our chances were slim because it was about 1am so most of them were probably already booked. But lucky us, we were bumped up to the executive suite! As soon as you open the door, there was a draft of the “brand spankin’ new apartment” scent. Ahh, I miss that scent – so clean, LOL. They must’ve just renovated it. The room was small for being an “executive” room but space is a hot commodity in Hong Kong so I wasn’t expecting much to begin with. 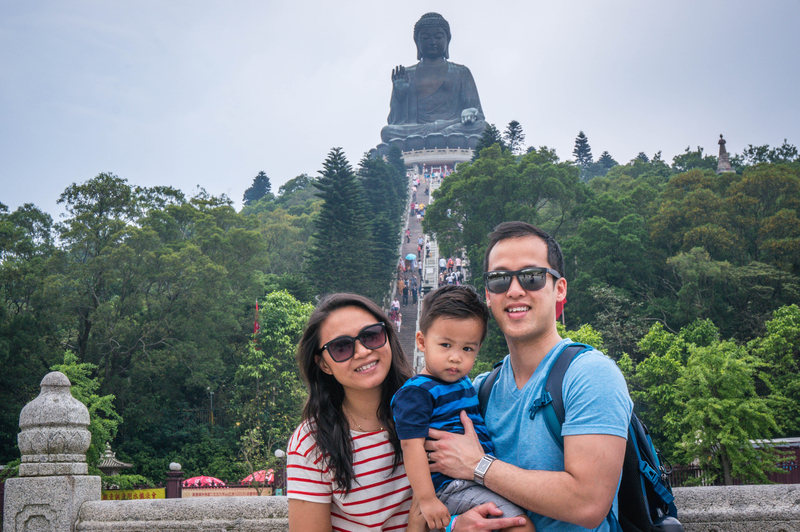 On our first day in Hong Kong, we did the Ngong Ping 360 cable car up to The Tian Tan Buddha or Big Buddha statue. We opted for the glass bottom cable car because, well, WHY NOT?! But I will write a more elaborate post about this later. After we got back, we skipped over to Food Republic (next door to the outlet mall) which was a short walk from the Ngong Ping 360 entrance. The Mr’s favorite activity is eating so his expression as we stepped out of the elevator was adorable. You could tell he was in his happy place. We opted for the cantonese restaurant because they had roasted ducks hanging in the window. The food was Mmm mm delicious! The roasted pork and roasted duck packed a punch of flavor. We have lived in Europe for almost 2 years now and there is a lack of flavor in asian foods so this was a special treat! 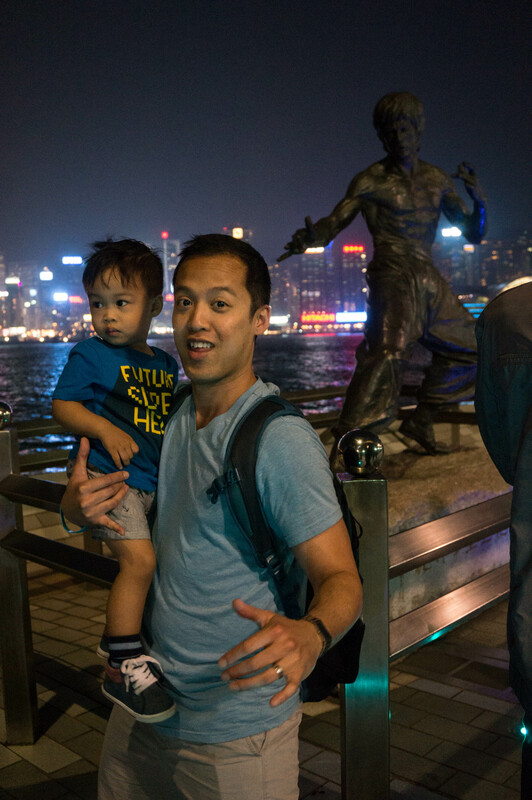 After we recharged at the hotel, we headed out to the Avenue of Stars so The Mr could visit his favorite actors like Bruce Lee and Jackie Chan. The Avenue of Stars is basically like Hollywood’s Walk of Fame. There was a booth there called “Butter Cuttle” which is baked, buttered cuttle fish. Once you get past the scent of it, it is chewy goodness! At 30 hkd, I was a happy camper. His childhood dreams are fulfilled and Ittybot is already over it. 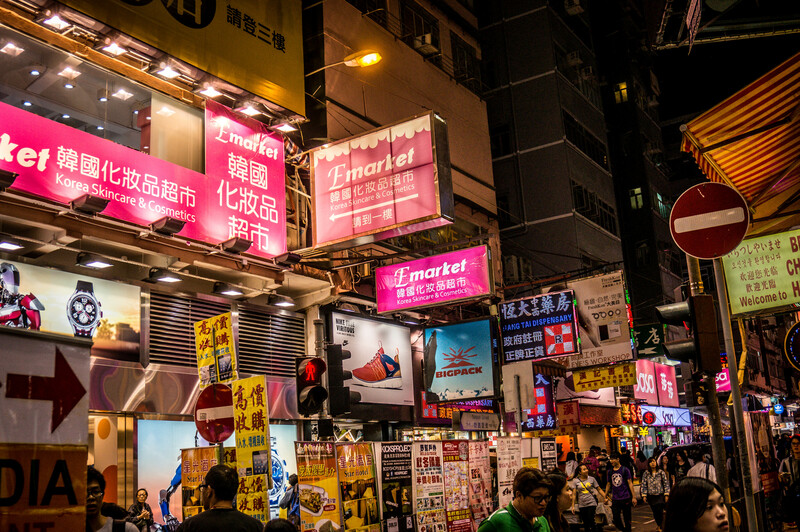 Next up, Mong Kok to do some shopping! My first stop was Innisfree because I HAD to pick up more sheet masks. After Innisfree, we wandered the stalls of the Ladies Market. It’s called the Ladies Market because there is mainly clothing and accessories for women but there is so much more than that! There are toys and trinkets galore! There may be a haul post in the future! We got (blissfully) lost looking for a quick bite to eat, but we ended up at McDonalds. I do like to try McDonalds in the different places we visit and Hong Kong is probably the best thus far! They like to season their fries, WHAT!? We got the seaweed seasoning, threw it in a bag with the fries and shake, shake, shake! We regret not going back for more, it was that good! Oh, and the spicy chicken sandwiches ACTUALLY had a little bit of spice to them. WIN in our books. The next leg of our trip takes us to Sanya, China. Sanya is on the island of Hainan and what they would call the “Hawaii of China”. I had high hopes for this leg. Shanghai was cold and windy so I was looking forward to some heat, sun, and sand. This time, we stayed at the Ramada hotel. As soon as you step foot into the hotel, you get the amazing breeze from the river. For this trip, I decided to ask for an upgrade. I figured it wouldn’t hurt to ask. Since we had a toddler we had to share the room with, I was sure they would understand the justification. And it worked! We were upgraded to a corner suite on the 25th floor. We felt like a million bucks. About that “Hawaii of China” title…I would have to disagree. To me, it felt more like a “Phuket”. Sanya has some nice beaches but it’s a little rough around the edges. The public beaches weren’t as pristine as we had hoped. It was packed and kind of dirty. 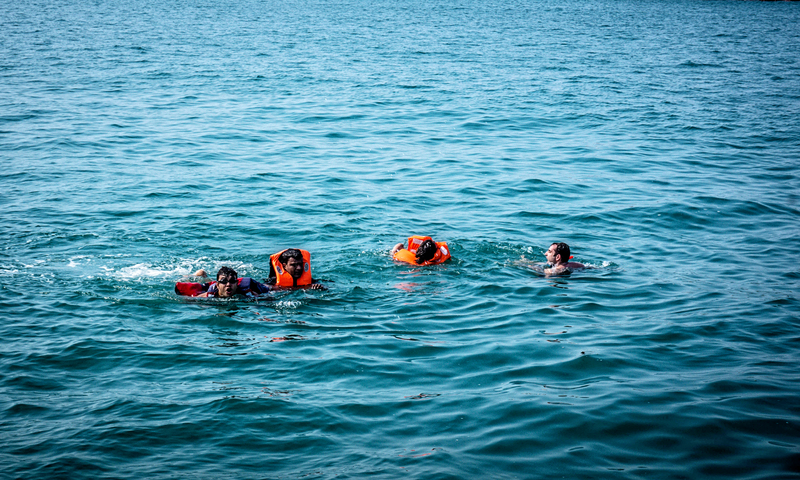 You couldn’t walk 10 feet without someone trying to convince you to do a water sport. Those google pictures are deceiving! I’m sure those pictures were taken at a private beach. Of course, we had to dine out all the time and I was disgusted by the customer service in Sanya. People were so incredibly rude! I just about throat punched a waitress at a Thai restaurant. But we won’t rehash those memories, LOL. 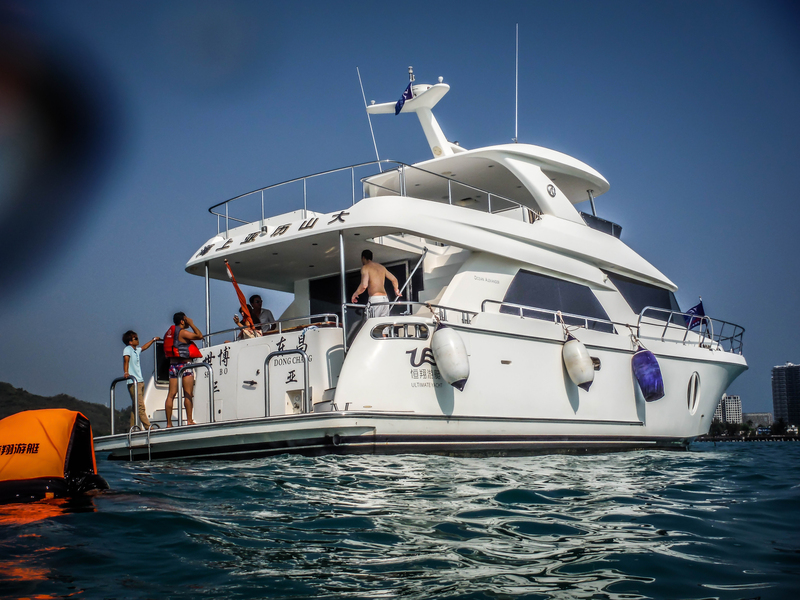 Just when I thought the Sanya experience was down the toilet, one of the guys on the trip got us on a yacht for an afternoon. It basically was the highlight and the lifesaver on this leg of the trip. The yacht was so much more than we had anticipated. It had 2 bedrooms, a karaoke room, sauna, dining room, kitchenette, the works. Everyone but Ittybot got to take a dip in the water. My poor baby! The bright side is that we got to spend a lot of time at our hotel relaxing and catching up on much needed R&R. The pool was great for the balmy days. 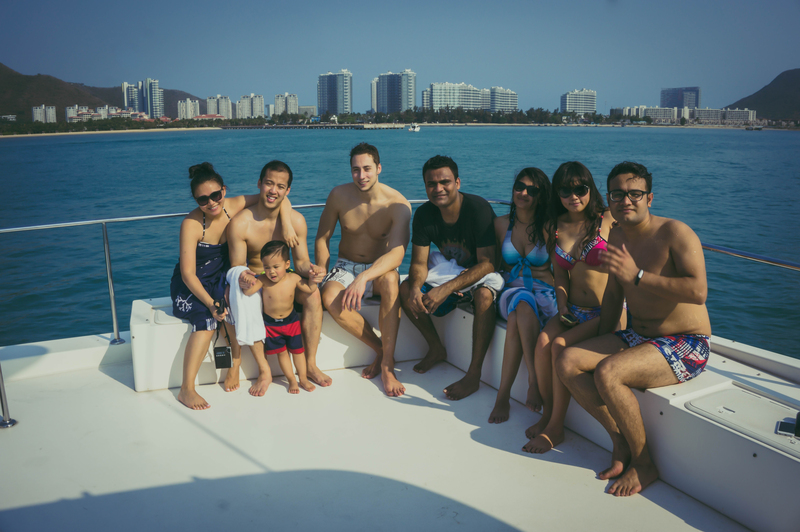 While we won’t miss Sanya anytime soon, we will miss that gorgeous weather! These pictures are all over my instagram feed, so naturally, I had to try it myself. 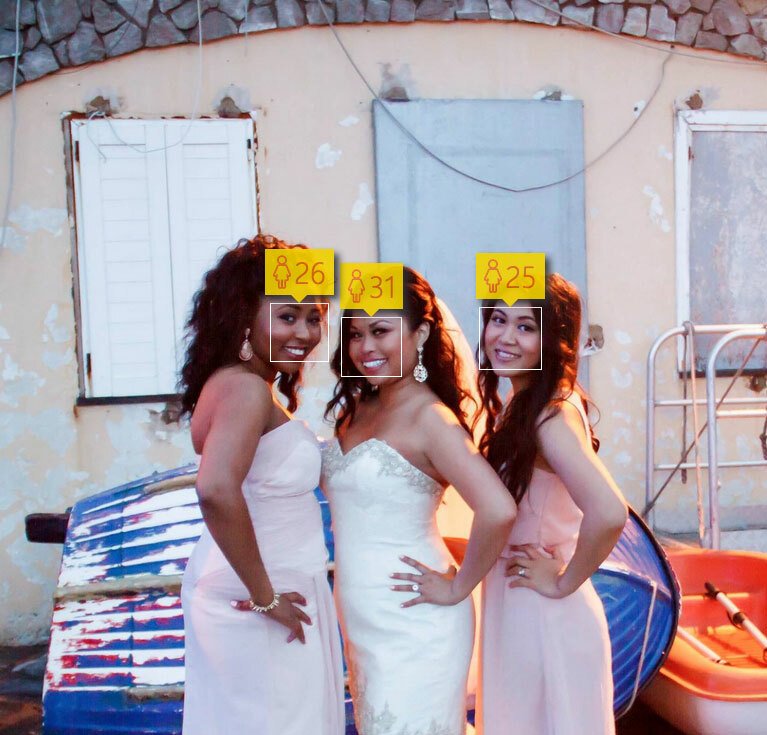 How-old.net determines your gender and how old you are by the pic you upload. Give it a try, it’s quite amusing! !